A quarta pista fica em baixo do quadro de um "cavaleiro" o tronco esconde, é onde fica dois olhos piscando. Is this quest repeatable? I'm assuming it is since it can be bought. Still would like a confirm. I made a quick visual aid for those who don't want to watch a video or find it themselves. 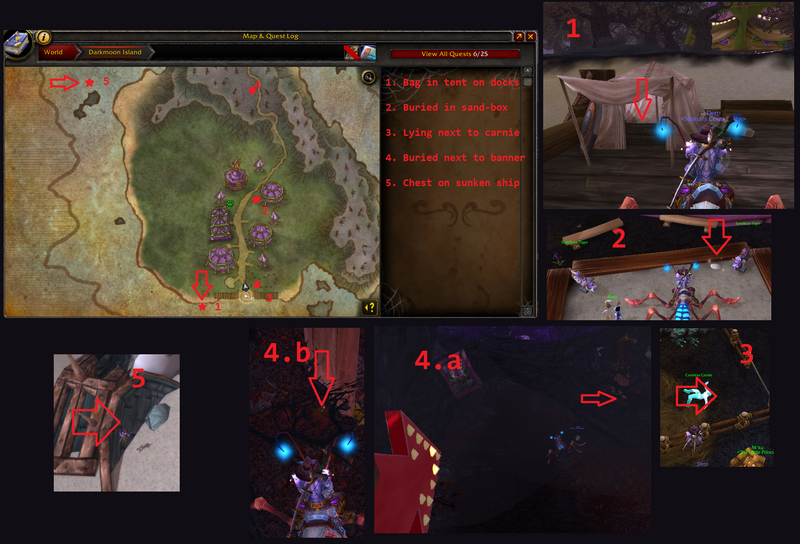 It's straightforward, the map shows the places to go in numbered order, the surrounding pictures, also numbered, show with arrows where the items are in the world. Since I didn't see the vendor's name anywhere, she is Galissa Lumigotas located at the docks. Do NOT complete step 5 if you are in a group. The first person to click the chest will get the loot and it will not respawn for others in the group. We opened a ticket with a GM for the issue. And you can't just skip all the notes. I just tried on my second tune to buy the quest. FYI: Do not complete in a group. Only one person was able to click each clue including the final treasure box so that person was the only one to get the 100 tickets and potions even though we all got credit for completing the quest. To start the one-time only quest Tesouro Escondido de Silas, you will need to have 100 Gorjadaga de Negraluna to purchase a Mapa do Tesouro Apagado from Galissa Lumigotas (she is located at the southern end of the Darkmoon Faire by the fishing docks). Reward for completion of the quest is Tesouro Escondido de Silas, which contains 100 Cupom Premiado de Negraluna. Is anyone else having the issue where once you get to the chest, you cannot interact with it? I found the 4 notes in order and am now sitting by the chest which is highlighted but won't allow me to interact with it...I had heard someone else had this issue but didn't hear of a fix. Any thoughts? I found a workaround for the non-clickable chest bug! It seems that the chest is bugging if you try to open it while in a raid group. On some realms, the chest is not yet bugged. What you can do is join such a realm, agro a small crab near the chest (but don't kill it), leave the group (that will leave you to that realm since you are in combat) and then click the chest! I just did this now and I got my quest and the 100 darkmoon prize tickets. I thought I would compile and combine some data regarding this quest. So I guess the chest is still bugged out, since I'm unable to interact with it. Threw a bug report but this is all of the dissapoint. I was really looking forward to the 100 tickets so I can buy the Rolo de Música: Carrossel de Negraluna to add some creep factor to my Garrison. It seems I was able to interact with the chest, all I did was sit by there for a bit while multitasking trying to look for a different sever to group in and lurk around here and the forums for other attempts to work around the bug. That, or it's on a secret lootable timer. I cant open the chest! 46g is a bit stingy on rewards considering int he same amoutn of time it takes to get to darkmoon fair, collect 100 of these fish and then hand them in. you could have made 46g 10 times over...not the greatest way to promote fishing as a profession if you ask me. why blizzard is so stingy on quest rewards i do not know. Especially when they give us garrisons and followers to go and get us free gold while we scratch our butts. Sounds like a fun quest though..just don't think its worht it at 46g rewards. Edit : sorry, i missed the part about 100 darkmoon tickets. that makes this worht it. :) hope it is repeatable monthly. Thank you Blizzard for fixing the bug before DMF is over for this month! I had a friend of mine invite me to party on Stormreaver-US and i was able to loot the chest with no problems..Tried doing the lfg with raid group as suggested in other comments and was one shotting the crabs to try to be in combat and leave group..being in a party worked fine. The once bugged chest is now fixed. The chest now gives up the loot! Made a 2 minute visual guide that quickly shows the locations. *If you have TomTom set to Go to the Closest Way Point, it might seem out of order - but it's not. 1st clue from quest giver is correct. BUT, if you have Closest Waypoint set up, it will point you to the Crystal Basilisk instead of the Sandbox. Just read the note under your waypoint which will have a 1,2,3.. etc. followed by where it is, i.e., Sandbox. Also, as of this edit, Still rocking those 100 Tickets! Was able to loot the chest by myself on Oceanic Frostmourne just now. Run this script to see if your toon has completed the quest already. Okay, this can apparently be done once per-event, as in once a month on every toon? I assumed I could do it only once ever, but the Darkmoon Faire guide on here says otherwise. I assume a lot of other people have also missed out on 100 easy tickets by making this same mistake (unless the guide is wrong). *** Update: Apparently the guide was/is inaccurate, this can only be done once per toon ever, not once per toon every month. I'd show a pic but they are never accepted. Under the banner right side facing it GL! i noticed a lot of ppl talking about doing the last part in a group or raid. Why? i did the entire chain solo. Never got aggro one time. Therefore i didnt have the issue of not being able to loot the crate. I am so thankful for Wowhead right now. I foolishly decided that I would try to do this quest without any sort of help, in an effort to re-experience the difficulty of some quests in Vanilla. After finding the first clue took me nearly 35 minutes (including my first aborted attempt). I finally realized that the first clue had lied to me by saying that Clue #2 was "on" something, rather than "in" the tent on the pier. I had double-checked the top of *every* tent, wagon, awning, pavilion, marquis and effing outhouse at the Faire. This made me angry. The majority of the clues are cryptic, but not outright lies like the first. Still, finding them can be tricky. Even if you know exactly where they are, clicking them isn't always easy. Turns out spoiling the "fun" by looking up the answer was actually more fun than playing the game. GG Blizz. I hope you're happy, because I feel like I never will be again. A real doozy. See the map above? It is correct. Go there. Oh... can't see what it is you are looking for, as per comments here at Wowhead? Some evil genius at Blizzard hehehehe decided that we are used to looking for the typical mounds. It ain't your typical mound. Still can't see it? Slow down. take a closer look. Go to Game Menu => System => Graphics => Ground Clutter. Set to low. Must be your medication, or lack thereof. Getting from the Fourth Clue to the Stash. Going the long way huh? Nah. Live dangerously. It's a little gloomy but just go for it! Watch your step mind you. Oh... you had to corpse walk? Sorry. Needless to say, it'll leave you breathless! You'll need to hold your breath! I'm not going to sit here and take directions from a man who thinks "hat" rhymes with "black." Level 15's very low and 100 tickets is a lot! That's not far short of a couple of replica dungeon set items for transmog. If you've got any lowbie characters you don't normally pay attention to it could be worth doing half an hours fishing to get this quest done. When transmog is account wide it won't matter if they're on some dead end server you forgot about and if you've got some gold there you could just buy the fish! EDIT: It seems, you can do this quest once a day, accros the account but only once per character. Started a Demon Hunter. Went to Darkmoon Island. Fished 1-283 before getting 100 of these. Took 130 minutes. I just did this, seeking another toy. I have many alts and according the script that checks status, I have not done this quest on this toon. I fished the 100 fish, got the quest, did the clues in order, found the stash, got Quest completion with 47G 40S, 22,800 XP (I'm level 101) and that's it. I did not get the 100 DMF prize tickets. WTF? I think they may have stealth nerfed this in a weekly patch. Time to search the Warcraft forums and Blue posts/tweets. Easiest way to put them in game is to use the Paste addon listed on Curse. It must have changed on Legion, but it did not give me 100 tickets. It only gave me 58 Gold 20 Silver as it says on Wowhead. Worthless waste of time for a Lvl 110. To start this quest you need to buy a Mapa do Tesouro Apagado from Galissa Lumigotas at the docks in Darkmoon Island (52,88). It costs a 100 Gorjadaga de Negralunas which can be fished from around the island or bought from the Auction House. Odd enough this quest does NOT provide any reputation with DMF once completed. Encontre o Tesouro Escondido de Silas. Tesouro Escondido de Silas encontrado. Um prêmio de Negraluna você almeja, mas saiba que vai ser uma peleja. Leia a primeira pista e parta em uma viagem: a pista está escrita do outro lado desta mensagem.